As the modern written language, Modern Standard Arabic is widely taught in schools and universities, and is used to varying degrees in workplaces, government, and the media. The two formal varieties are grouped together as Literary Arabic (fuṣḥā), which is the official language of 26 states, and the liturgical language of the religion of Islam, since the Quran and Hadith were written in Arabic. Modern Standard Arabic largely follows the grammatical standards of Classical Arabic, and uses much of the same vocabulary. However, it has discarded some grammatical constructions and vocabulary that no longer have any counterpart in the spoken varieties, and has adopted certain new constructions and vocabulary from the spoken varieties. Much of the new vocabulary is used to denote concepts that have arisen in the post-classical era, especially in modern times. Due to its grounding in Classical Arabic, Modern Standard Arabic is removed over a millennium from everyday speech, which is construed as a multitude of dialects of this language. These dialects and Modern Standard Arabic are described by some scholars as not mutually comprehensible. The former are usually acquired in families, while the latter is taught in formal education settings. However, there have been studies reporting some degree of comprehension of stories told in the standard variety among preschool-aged children. The relation between Modern Standard Arabic and these dialects is sometimes compared to that of Latin and vernaculars (or today's French, Czech or German) in medieval and early modern Europe. This view though does not take into account the widespread use of Modern Standard Arabic as a medium of audiovisual communication in today's mass media—a function Latin has never performed. In late pre-Islamic times, a transdialectal and transcommunal variety of Arabic emerged in the Hejaz which continued living its parallel life after literary Arabic had been institutionally standardized in the 2nd and 3rd century of the Hijra, most strongly in Judeo-Christian texts, keeping alive ancient features eliminated from the "learned" tradition (Classical Arabic). This variety and both its classicizing and "lay" iterations have been termed Middle Arabic in the past, but they are thought to continue an Old Higazi register. It is clear that the orthography of the Qur'an was not developed for the standardized form of Classical Arabic; rather, it shows the attempt on the part of writers to record an archaic form of Old Higazi. In the late 6th century AD, a relatively uniform intertribal "poetic koine" distinct from the spoken vernaculars developed based on the Bedouin dialects of Najd, probably in connection with the court of al-Ḥīra. During the first Islamic century, the majority of Arabic poets and Arabic-writing persons spoke Arabic as their mother tongue. Their texts, although mainly preserved in far later manuscripts, contain traces of non-standardized Classical Arabic elements in morphology and syntax. The standardization of Classical Arabic reached completion around the end of the 8th century. The first comprehensive description of the ʿarabiyya "Arabic", Sībawayhi's al-Kitāb, is based first of all upon a corpus of poetic texts, in addition to Qur'an usage and Bedouin informants whom he considered to be reliable speakers of the ʿarabiyya. By the 8th century, knowledge of Classical Arabic had become an essential prerequisite for rising into the higher classes throughout the Islamic world. Charles Ferguson's koine theory (Ferguson 1959) claims that the modern Arabic dialects collectively descend from a single military koine that sprang up during the Islamic conquests; this view has been challenged in recent times. Ahmad al-Jallad proposes that there were at least two considerably distinct types of Arabic on the eve of the conquests: Northern and Central (Al-Jallad 2009). The modern dialects emerged from a new contact situation produced following the conquests. Instead of the emergence of a single or multiple koines, the dialects contain several sedimentary layers of borrowed and areal features, which they absorbed at different points in their linguistic histories. According to Veersteegh and Bickerton, colloquial Arabic dialects arose from pidginized Arabic formed from contact between Arabs and conquered peoples. Pidginization and subsequent creolization among Arabs and arabized peoples could explain relative morphological and phonological simplicity of vernacular Arabic compared to Classical and MSA. MSA is the variety used in most current, printed Arabic publications, spoken by some of the Arabic media across North Africa and the Middle East, and understood by most educated Arabic speakers. "Literary Arabic" and "Standard Arabic" (فُصْحَى‎ fuṣḥá) are less strictly defined terms that may refer to Modern Standard Arabic or Classical Arabic. MSA uses much Classical vocabulary (e.g., dhahaba 'to go') that is not present in the spoken varieties, but deletes Classical words that sound obsolete in MSA. In addition, MSA has borrowed or coined a large number of terms for concepts that did not exist in Quranic times, and MSA continues to evolve. Some words have been borrowed from other languages—notice that transliteration mainly indicates spelling and not real pronunciation (e.g., فِلْم‎ film 'film' or ديمقراطية‎ dīmuqrāṭiyyah 'democracy'). However, the current preference is to avoid direct borrowings, preferring to either use loan translations (e.g., فرع‎ farʻ 'branch', also used for the branch of a company or organization; جناح‎ janāḥ 'wing', is also used for the wing of an airplane, building, air force, etc. ), or to coin new words using forms within existing roots (استماتة‎ istimātah 'apoptosis', using the root موت‎ m/w/t 'death' put into the Xth form, or جامعة‎ jāmiʻah 'university', based on جمع‎ jamaʻa 'to gather, unite'; جمهورية‎ jumhūriyyah 'republic', based on جمهور‎ jumhūr 'multitude'). An earlier tendency was to redefine an older word although this has fallen into disuse (e.g., هاتف‎ hātif 'telephone' < 'invisible caller (in Sufism)'; جريدة‎ jarīdah 'newspaper' < 'palm-leaf stalk'). Even during Muhammad's lifetime, there were dialects of spoken Arabic. Muhammad spoke in the dialect of Mecca, in the western Arabian peninsula, and it was in this dialect that the Quran was written down. However, the dialects of the eastern Arabian peninsula were considered the most prestigious at the time, so the language of the Quran was ultimately converted to follow the eastern phonology. It is this phonology that underlies the modern pronunciation of Classical Arabic. The phonological differences between these two dialects account for some of the complexities of Arabic writing, most notably the writing of the glottal stop or hamzah (which was preserved in the eastern dialects but lost in western speech) and the use of alif maqṣūrah (representing a sound preserved in the western dialects but merged with ā in eastern speech). The sociolinguistic situation of Arabic in modern times provides a prime example of the linguistic phenomenon of diglossia, which is the normal use of two separate varieties of the same language, usually in different social situations. In the case of Arabic, educated Arabs of any nationality can be assumed to speak both their school-taught Standard Arabic as well as their native, mutually unintelligible "dialects"; these dialects linguistically constitute separate languages which may have dialects of their own. When educated Arabs of different dialects engage in conversation (for example, a Moroccan speaking with a Lebanese), many speakers code-switch back and forth between the dialectal and standard varieties of the language, sometimes even within the same sentence. Arabic speakers often improve their familiarity with other dialects via music or film. Terms borrowed range from religious terminology (like Berber taẓallit, "prayer", from salat (صلاة‎ ṣalāh)), academic terms (like Uyghur mentiq, "logic"), and economic items (like English coffee) to placeholders (like Spanish fulano, "so-and-so"), everyday terms (like Hindustani lekin, "but", or Spanish taza and French tasse, meaning "cup"), and expressions (like Catalan a betzef, "galore, in quantity"). Most Berber varieties (such as Kabyle), along with Swahili, borrow some numbers from Arabic. Most Islamic religious terms are direct borrowings from Arabic, such as صلاة‎ (salat), "prayer", and إمام‎ (imam), "prayer leader." Arabic words also made their way into several West African languages as Islam spread across the Sahara. Variants of Arabic words such as كتاب‎ kitāb ("book") have spread to the languages of African groups who had no direct contact with Arab traders. jazīrah (جزيرة), as in the well-known form الجزيرة "Al-Jazeera," means "island" and has its origin in the Syriac ܓܙܝܪܗ gazīra. The Beirut newspaper La Syrie pushed for the change from Arabic script to Latin letters in 1922. The major head of this movement was Louis Massignon, a French Orientalist, who brought his concern before the Arabic Language Academy in Damascus in 1928. Massignon's attempt at Romanization failed as the Academy and population viewed the proposal as an attempt from the Western world to take over their country. Sa'id Afghani, a member of the Academy, mentioned that the movement to Romanize the script was a Zionist plan to dominate Lebanon. The repetition in the Quran introduced the true power and impact repetition can have in poetry. The repetition of certain words and phrases made them appear more firm and explicit in the Quran. The Quran uses constant metaphors of blindness and deafness to imply unbelief. Metaphors were not a new concept to poetry, however the strength of extended metaphors was. The explicit imagery in the Quran inspired many poets to include and focus on the feature in their own work. The poet ibn al Mu'tazz wrote a book regarding the figures of speech inspired by his study of the Quran. Poets such as badr Shakir al sayyab expresses his political opinion in his work through imagery inspired by the forms of more harsher imagery used in the Quran. The Quran uses figurative devices in order to express the meaning in the most beautiful form possible. The study of the pauses in the Quran as well as other rhetoric allow it to be approached in a multiple ways. The writer al-Khattabi explains how culture is a required element to create a sense of art in work as well as understand it. He believes that fluency and harmony the Quran possess are not the only elements that make it beautiful and create a bond between the reader and the text. While a lot of poetry was deemed comparable to the Quran in that it is equal to or better than the composition of the Quran, a debate rose that such statements are not possible because humans are incapable of composing work comparable to the Quran. Because the structure of the Quran made it difficult for a clear timeline to be seen, Hadith were the main source of chronological order. The Hadith were passed down from generation to generation and this tradition became a large resource for understanding the context. Poetry after the Quran began possessing this element of tradition by including ambiguity and background information to be required to understand the meaning. After the Quran came down to the people, the tradition of memorizing the verses became present. It is believed that the greater the amount of the Quran memorized, the greater the faith. As technology improved over time, hearing recitations of Quran became more available as well as more tools to help memorize the verses. The tradition of Love Poetry served as a symbolic representation of a Muslim's desire for a closer contact with their Lord. 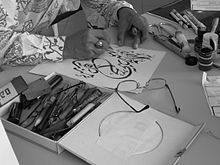 While the influence of the Quran on Arabic poetry is explained and defended by numerous writers, some writers such as Al- Baqillani believe that poetry and the Quran are in no conceivable way related due to the uniqueness of the Quran. Poetry's imperfections prove his points that they cannot be compared with the fluency the Quran holds. Classical Arabic is the language of poetry and literature (including news); it is also mainly the language of the Quran. Classical Arabic is closely associated with the religion of Islam because the Quran was written in it. Most of the world's Muslims do not speak Classical Arabic as their native language, but many can read the Quranic script and recite the Quran. Among non-Arab Muslims, translations of the Quran are most often accompanied by the original text. At present, Modern Standard Arabic (MSA) is also used in modernized versions of literary forms of the Quran. One factor in the differentiation of the dialects is influence from the languages previously spoken in the areas, which have typically provided a significant number of new words and have sometimes also influenced pronunciation or word order; however, a much more significant factor for most dialects is, as among Romance languages, retention (or change of meaning) of different classical forms. Thus Iraqi aku, Levantine fīh and North African kayən all mean 'there is', and all come from Classical Arabic forms (yakūn, fīhi, kā'in respectively), but now sound very different. Change of a to i in many affixes (e.g., non-past-tense prefixes ti- yi- ni-; wi- 'and'; il- 'the'; feminine -it in the construct state). Reformation of geminate verbs, e.g., ḥalaltu 'I untied' → ḥalēt(u). Conversion of separate words lī 'to me', laka 'to you', etc. into indirect-object clitic suffixes. Certain changes in the cardinal number system, e.g., khamsat ayyām 'five days' → kham(a)s tiyyām, where certain words have a special plural with prefixed t.
Adjective plurals of the form kibār 'big' → kubār. Certain lexical items, e.g., jāb 'bring' < jāʼa bi- 'come with'; shāf 'see'; ēsh 'what' (or similar) < ayyu shayʼ 'which thing'; illi (relative pronoun). Maghrebi Arabic, also called "Darija" spoken by about 70 million people in Morocco, Algeria, Tunisia and Libya. It also forms the basis of Maltese, which is not part of the Arabic macrolanguage but is descended from the extinct Sicilian Arabic dialect which had Maghrebi origin. Maghrebi Arabic is very hard to understand for Arabic speakers from the Mashriq or Mesopotamia, the easiest being Libyan Arabic and the hardest Moroccan Arabic. The others such as Algerian Arabic can be considered "in between". Mesopotamian Arabic, spoken by about 32 million people in Iraq (where it is called "Aamiyah"), eastern Syria and southwestern Iran (Khuzestan). Gulf Arabic, spoken by around four million people, predominantly in Kuwait, Bahrain, some parts of Oman, eastern Saudi Arabia coastal areas and some parts of UAE and Qatar. Also spoken in Iran's Bushehr and Hormozgan provinces. Although Gulf Arabic is spoken in Qatar, most Qatari citizens speak Najdi Arabic (Bedawi). Reduction of /j/ and /w/ between vowels occurs in a number of circumstances and is responsible for much of the complexity of third-weak ("defective") verbs. Early Akkadian transcriptions of Arabic names shows that this reduction had not yet occurred as of the early part of the 1st millennium BC. An interesting feature of the writing system of the Quran (and hence of Classical Arabic) is that it contains certain features of Muhammad's native dialect of Mecca, corrected through diacritics into the forms of standard Classical Arabic. Among these features visible under the corrections are the loss of the glottal stop and a differing development of the reduction of certain final sequences containing /j/: Evidently, final /-awa/ became /aː/ as in the Classical language, but final /-aja/ became a different sound, possibly /eː/ (rather than again /aː/ in the Classical language). This is the apparent source of the alif maqṣūrah 'restricted alif' where a final /-aja/ is reconstructed: a letter that would normally indicate /j/ or some similar high-vowel sound, but is taken in this context to be a logical variant of alif and represent the sound /aː/. The "colloquial" spoken dialects of Arabic are learned at home and constitute the native languages of Arabic speakers. "Formal" Literary Arabic (usually specifically Modern Standard Arabic) is learned at school; although many speakers have a native-like command of the language, it is technically not the native language of any speakers. Both varieties can be both written and spoken, although the colloquial varieties are rarely written down and the formal variety is spoken mostly in formal circumstances, e.g., in radio and TV broadcasts, formal lectures, parliamentary discussions and to some extent between speakers of different colloquial dialects. Even when the literary language is spoken, however, it is normally only spoken in its pure form when reading a prepared text out loud and communication between speakers of different colloquial dialects. When speaking extemporaneously (i.e. making up the language on the spot, as in a normal discussion among people), speakers tend to deviate somewhat from the strict literary language in the direction of the colloquial varieties. In fact, there is a continuous range of "in-between" spoken varieties: from nearly pure Modern Standard Arabic (MSA), to a form that still uses MSA grammar and vocabulary but with significant colloquial influence, to a form of the colloquial language that imports a number of words and grammatical constructions in MSA, to a form that is close to pure colloquial but with the "rough edges" (the most noticeably "vulgar" or non-Classical aspects) smoothed out, to pure colloquial. The particular variant (or register) used depends on the social class and education level of the speakers involved and the level of formality of the speech situation. Often it will vary within a single encounter, e.g., moving from nearly pure MSA to a more mixed language in the process of a radio interview, as the interviewee becomes more comfortable with the interviewer. This type of variation is characteristic of the diglossia that exists throughout the Arabic-speaking world. Recording of a poem by Al-Ma'arri titled "I no longer steal from nature"
Although Modern Standard Arabic (MSA) is a unitary language, its pronunciation varies somewhat from country to country and from region to region within a country. The variation in individual "accents" of MSA speakers tends to mirror corresponding variations in the colloquial speech of the speakers in question, but with the distinguishing characteristics moderated somewhat. Note that it is important in descriptions of "Arabic" phonology to distinguish between pronunciation of a given colloquial (spoken) dialect and the pronunciation of MSA by these same speakers. Although they are related, they are not the same. For example, the phoneme that derives from Classical Arabic /ɟ/ has many different pronunciations in the modern spoken varieties, e.g., [d͡ʒ ~ ʒ ~ j ~ ɡʲ ~ ɡ] including the proposed original [ɟ]. Speakers whose native variety has either [d͡ʒ] or [ʒ] will use the same pronunciation when speaking MSA. Even speakers from Cairo, whose native Egyptian Arabic has [ɡ], normally use [ɡ] when speaking MSA. The [j] of Persian Gulf speakers is the only variant pronunciation which isn't found in MSA; [d͡ʒ~ʒ] is used instead, but may use [j] in MSA for comfortable pronunciation. Another reason of different pronunciations is influence of colloquial dialects. The differentiation of pronunciation of colloquial dialects is the influence from other languages previously spoken and some still presently spoken in the regions, such as Coptic in Egypt, Berber, Punic, or Phoenician in North Africa, Himyaritic, Modern South Arabian, and Old South Arabian in Yemen and Oman, and Aramaic and Canaanite languages (including Phoenician) in the Levant and Mesopotamia. The definition of both "emphatic" and "neighborhood" vary in ways that reflect (to some extent) corresponding variations in the spoken dialects. Generally, the consonants triggering "emphatic" allophones are the pharyngealized consonants /tˤ dˤ sˤ ðˤ/; /q/; and /r/, if not followed immediately by /i(ː)/. Frequently, the velar fricatives /x ɣ/ also trigger emphatic allophones; occasionally also the pharyngeal consonants /ʕ ħ/ (the former more than the latter). Many dialects have multiple emphatic allophones of each vowel, depending on the particular nearby consonants. In most MSA accents, emphatic coloring of vowels is limited to vowels immediately adjacent to a triggering consonant, although in some it spreads a bit farther: e.g., وقت‎ waqt [wɑqt] 'time'; وطن‎ waṭan [wɑtˤɑn] 'homeland'; وسط المدينة‎ wasṭ al-madīnah [wæstˤɑl-mædiːnɐ] 'downtown' (sometimes [wɑstˤɑl-mædiːnæ] or similar). In a non-emphatic environment, the vowel /a/ in the diphthong /aj/ tends to be fronted even more than elsewhere, often pronounced [æj] or [ɛj]: hence سيف‎ sayf [sajf ~ sæjf ~ sɛjf] 'sword' but صيف‎ ṣayf [sˤɑjf] 'summer'. However, in accents with no emphatic allophones of /a/ (e.g., in the Hejaz), the pronunciation [aj] or [äj] occurs in all situations. The phoneme /d͡ʒ/ is represented by the Arabic letter jīm (ج‎) and has many standard pronunciations. [d͡ʒ] is characteristic of north Algeria, Iraq, and most of the Arabian peninsula but with an allophonic [ʒ] in some positions; [ʒ] occurs in most of the Levant and most North Africa; and [ɡ] is used in most of Egypt and some regions in Yemen and Oman. Generally this corresponds with the pronunciation in the colloquial dialects. In some regions in Sudan and Yemen, as well as in some Sudanese and Yemeni dialects, it may be either [ɡʲ] or [ɟ], representing the original pronunciation of Classical Arabic. Foreign words containing /ɡ/ may be transcribed with ج‎, غ‎, ك‎, ق‎, گ‎, ݣ or ڨ, mainly depending on the regional spoken variety of Arabic or the commonly diacriticized Arabic letter. Note also that in northern Egypt, where the Arabic letter jīm (ج‎) is normally pronounced [ɡ], a separate phoneme /ʒ/, which may be transcribed with چ‎, occurs in a small number of mostly non-Arabic loanwords, e.g., /ʒakitta/ 'jacket'. Arabic has consonants traditionally termed "emphatic" /tˤ, dˤ, sˤ, ðˤ/ (ط,‎ ض,‎ ص,‎ ظ‎), which exhibit simultaneous pharyngealization [tˤ, dˤ, sˤ, ðˤ] as well as varying degrees of velarization [tˠ, dˠ, sˠ, ðˠ], so they may be written with the "Velarized or pharyngealized" diacritic ( ̴) as: /t̴, d̴, s̴, ð̴/. This simultaneous articulation is described as "Retracted Tongue Root" by phonologists. In some transcription systems, emphasis is shown by capitalizing the letter, for example, /dˤ/ is written ⟨D⟩; in others the letter is underlined or has a dot below it, for example, ⟨ḍ⟩. Vowels and consonants can be phonologically short or long. Long (geminate) consonants are normally written doubled in Latin transcription (i.e. bb, dd, etc. ), reflecting the presence of the Arabic diacritic mark shaddah, which indicates doubled consonants. In actual pronunciation, doubled consonants are held twice as long as short consonants. This consonant lengthening is phonemically contrastive: قبل‎ qabila 'he accepted' vs. قبّل‎ qabbala 'he kissed'. If the word occurs after another word ending in a consonant, there is a smooth transition from final consonant to initial vowel, e.g., اجتماع‎ al-ijtimāʻ 'meeting' /alid͡ʒtimaːʕ/. If the word occurs after another word ending in a vowel, the initial vowel of the word is elided, e.g., بيت المدير‎ baytu (a)l-mudīr 'house of the director' /bajtulmudiːr/. If the word occurs at the beginning of an utterance, a glottal stop [ʔ] is added onto the beginning, e.g., البيت هو‎ al-baytu huwa ... 'The house is ...' /ʔalbajtuhuwa ... /. As a special exception, in Form VII and VIII verb forms stress may not be on the first syllable, despite the above rules: Hence inkatab(a) 'he subscribed' (whether or not the final short vowel is pronounced), yankatib(u) 'he subscribes' (whether or not the final short vowel is pronounced), yankatib 'he should subscribe (juss.)'. Likewise Form VIII ishtarā 'he bought', yashtarī 'he buys'. Examples:kitāb(un) 'book', kā-ti-b(un) 'writer', mak-ta-b(un) 'desk', ma-kā-ti-b(u) 'desks', mak-ta-ba-tun 'library' (but mak-ta-ba(-tun) 'library' in short pronunciation), ka-ta-bū (Modern Standard Arabic) 'they wrote' = ka-ta-bu (dialect), ka-ta-bū-h(u) (Modern Standard Arabic) 'they wrote it' = ka-ta-bū (dialect), ka-ta-ba-tā (Modern Standard Arabic) 'they (dual, fem) wrote', ka-tab-tu (Modern Standard Arabic) 'I wrote' = ka-tabt (short form or dialect). Doubled consonants count as two consonants: ma-jal-la-(tan) 'magazine', ma-ḥall(-un) "place". These rules may result in differently stressed syllables when final case endings are pronounced, vs. the normal situation where they are not pronounced, as in the above example of mak-ta-ba-tun 'library' in full pronunciation, but mak-ta-ba(-tun) 'library' in short pronunciation. The nunation endings -an -in -un are not pronounced. However, they are pronounced in adverbial accusative formations, e.g., taqrīban تَقْرِيبًا 'almost, approximately', ʻādatan عَادَةً 'usually'. The tāʾ marbūṭah ending ة is unpronounced, except in construct state nouns, where it sounds as t (and in adverbial accusative constructions, e.g., ʻādatan عَادَةً 'usually', where the entire -tan is pronounced). Full endings (including case endings) occur when a clitic object or possessive suffix is added (e.g., -nā 'us/our'). As mentioned above, many spoken dialects have a process of emphasis spreading, where the "emphasis" (pharyngealization) of emphatic consonants spreads forward and back through adjacent syllables, pharyngealizing all nearby consonants and triggering the back allophone [ɑ(ː)] in all nearby low vowels. The extent of emphasis spreading varies. For example, in Moroccan Arabic, it spreads as far as the first full vowel (i.e. sound derived from a long vowel or diphthong) on either side; in many Levantine dialects, it spreads indefinitely, but is blocked by any /j/ or /ʃ/; while in Egyptian Arabic, it usually spreads throughout the entire word, including prefixes and suffixes. In Moroccan Arabic, /i u/ also have emphatic allophones [e~ɛ] and [o~ɔ], respectively. Early in the expansion of Arabic, the separate emphatic phonemes [ɮˤ] and [ðˤ] coalesced into a single phoneme [ðˤ]. Many dialects (such as Egyptian, Levantine, and much of the Maghreb) subsequently lost interdental fricatives, converting [θ ð ðˤ] into [t d dˤ]. Most dialects borrow "learned" words from the Standard language using the same pronunciation as for inherited words, but some dialects without interdental fricatives (particularly in Egypt and the Levant) render original [θ ð ðˤ dˤ] in borrowed words as [s z zˤ dˤ]. ج‎ /d͡ʒ/ is pronounced as an affricate in Iraq and much of the Arabian Peninsula but is pronounced [ɡ] in most of North Egypt and parts of Yemen and Oman, [ʒ] in Morocco, Tunisia, and the Levant, and [j], [i̠] in most words in much of the Persian Gulf. ك‎ /k/ usually retains its original pronunciation but is palatalized to /t͡ʃ/ in many words in Israel and the Palestinian Territories, Iraq, and countries in the eastern part of the Arabian Peninsula. Often a distinction is made between the suffixes /-ak/ ('you', masc.) and /-ik/ ('you', fem. ), which become /-ak/ and /-it͡ʃ/, respectively. In Sana'a, Omani, and Bahrani /-ik/ is pronounced /-iʃ/. As in other Semitic languages, Arabic has a complex and unusual morphology (i.e. method of constructing words from a basic root). Arabic has a nonconcatenative "root-and-pattern" morphology: A root consists of a set of bare consonants (usually three), which are fitted into a discontinuous pattern to form words. For example, the word for 'I wrote' is constructed by combining the root k-t-b 'write' with the pattern -a-a-tu 'I Xed' to form katabtu 'I wrote'. Other verbs meaning 'I Xed' will typically have the same pattern but with different consonants, e.g. qaraʼtu 'I read', akaltu 'I ate', dhahabtu 'I went', although other patterns are possible (e.g. sharibtu 'I drank', qultu 'I said', takallamtu 'I spoke', where the subpattern used to signal the past tense may change but the suffix -tu is always used). Nouns in Literary Arabic have three grammatical cases (nominative, accusative, and genitive [also used when the noun is governed by a preposition]); three numbers (singular, dual and plural); two genders (masculine and feminine); and three "states" (indefinite, definite, and construct). The cases of singular nouns (other than those that end in long ā) are indicated by suffixed short vowels (/-u/ for nominative, /-a/ for accusative, /-i/ for genitive). The following shows a paradigm of a regular Arabic verb, kataba 'to write'. Note that in Modern Standard, the energetic mood (in either long or short form, which have the same meaning) is almost never used. For verbs, a given root can occur in many different derived verb stems (of which there are about fifteen), each with one or more characteristic meanings and each with its own templates for the past and non-past stems, active and passive participles, and verbal noun. These are referred to by Western scholars as "Form I", "Form II", and so on through "Form XV" (although Forms XI to XV are rare). These stems encode grammatical functions such as the causative, intensive and reflexive. Stems sharing the same root consonants represent separate verbs, albeit often semantically related, and each is the basis for its own conjugational paradigm. As a result, these derived stems are part of the system of derivational morphology, not part of the inflectional system. II kattaba 'he made (someone) write' yukattibu "he makes (someone) write"
The associated participles and verbal nouns of a verb are the primary means of forming new lexical nouns in Arabic. This is similar to the process by which, for example, the English gerund "meeting" (similar to a verbal noun) has turned into a noun referring to a particular type of social, often work-related event where people gather together to have a "discussion" (another lexicalized verbal noun). Another fairly common means of forming nouns is through one of a limited number of patterns that can be applied directly to roots, such as the "nouns of location" in ma- (e.g. maktab 'desk, office' < k-t-b 'write', maṭbakh 'kitchen' < ṭ-b-kh 'cook'). The feminine suffix -ah; variously derives terms for women from related terms for men, or more generally terms along the same lines as the corresponding masculine, e.g. maktabah 'library' (also a writing-related place, but different from maktab, as above). The nisbah suffix -iyy-. This suffix is extremely productive, and forms adjectives meaning "related to X". It corresponds to English adjectives in -ic, -al, -an, -y, -ist, etc. The feminine nisbah suffix -iyyah. This is formed by adding the feminine suffix -ah onto nisba adjectives to form abstract nouns. For example, from the basic root sh-r-k 'share' can be derived the Form VIII verb ishtaraka 'to cooperate, participate', and in turn its verbal noun ishtirāk 'cooperation, participation' can be formed. This in turn can be made into a nisbah adjective ishtirākī 'socialist', from which an abstract noun ishtirākiyyah 'socialism' can be derived. Other recent formations are jumhūriyyah 'republic' (lit. "public-ness", < jumhūr 'multitude, general public'), and the Gaddafi-specific variation jamāhīriyyah 'people's republic' (lit. "masses-ness", < jamāhīr 'the masses', pl. of jumhūr, as above). katáb-t á-ktib bá-ktib ḥá-ktib "
kátab yí-ktib bi-yí-ktib ḥa-yí-ktib "
katáb-na ní-ktib bi-ní-ktib ḥá-ní-ktib "
kátab-u yi-ktíb-u bi-yi-ktíb-u ḥa-yi-ktíb-u "
However, the old Maghrebi variant has been abandoned except for calligraphic purposes in the Maghreb itself, and remains in use mainly in the Quranic schools (zaouias) of West Africa. Arabic, like all other Semitic languages (except for the Latin-written Maltese, and the languages with the Ge'ez script), is written from right to left. There are several styles of script, notably naskh, which is used in print and by computers, and ruqʻah, which is commonly used in handwriting. There are a number of different standards for the romanization of Arabic, i.e. methods of accurately and efficiently representing Arabic with the Latin script. There are various conflicting motivations involved, which leads to multiple systems. Some are interested in transliteration, i.e. representing the spelling of Arabic, while others focus on transcription, i.e. representing the pronunciation of Arabic. (They differ in that, for example, the same letter ي‎ is used to represent both a consonant, as in "you" or "yet", and a vowel, as in "me" or "eat".) Some systems, e.g. for scholarly use, are intended to accurately and unambiguously represent the phonemes of Arabic, generally making the phonetics more explicit than the original word in the Arabic script. These systems are heavily reliant on diacritical marks such as "š" for the sound equivalently written sh in English. Other systems (e.g. the Bahá'í orthography) are intended to help readers who are neither Arabic speakers nor linguists with intuitive pronunciation of Arabic names and phrases. These less "scientific" systems tend to avoid diacritics and use digraphs (like sh and kh). These are usually simpler to read, but sacrifice the definiteness of the scientific systems, and may lead to ambiguities, e.g. whether to interpret sh as a single sound, as in gash, or a combination of two sounds, as in gashouse. The ALA-LC romanization solves this problem by separating the two sounds with a prime symbol ( ′ ); e.g., as′hal 'easier'. To handle those Arabic letters that cannot be accurately represented using the Latin script, numerals and other characters were appropriated. For example, the numeral "3" may be used to represent the Arabic letter ⟨ع‎⟩. There is no universal name for this type of transliteration, but some have named it Arabic Chat Alphabet. Other systems of transliteration exist, such as using dots or capitalization to represent the "emphatic" counterparts of certain consonants. For instance, using capitalization, the letter ⟨د‎⟩, may be represented by d. Its emphatic counterpart, ⟨ض‎⟩, may be written as D.
In most of present-day North Africa, the Western Arabic numerals (0, 1, 2, 3, 4, 5, 6, 7, 8, 9) are used. However, in Egypt and Arabic-speaking countries to the east of it, the Eastern Arabic numerals (٠ – ١ – ٢ – ٣ – ٤ – ٥ – ٦ – ٧ – ٨ – ٩) are in use. When representing a number in Arabic, the lowest-valued position is placed on the right, so the order of positions is the same as in left-to-right scripts. Sequences of digits such as telephone numbers are read from left to right, but numbers are spoken in the traditional Arabic fashion, with units and tens reversed from the modern English usage. For example, 24 is said "four and twenty" just like in the German language (vierundzwanzig) and Classical Hebrew, and 1975 is said "a thousand and nine-hundred and five and seventy" or, more eloquently, "a thousand and nine-hundred five seventy"
In modern times, the educated upper classes in the Arab world have taken a nearly opposite view. Yasir Suleiman wrote in 2011 that "studying and knowing English or French in most of the Middle East and North Africa have become a badge of sophistication and modernity and ... feigning, or asserting, weakness or lack of facility in Arabic is sometimes paraded as a sign of status, class, and perversely, even education through a mélange of code-switching practises." ^ a b "Arabic – Ethnologue". Ethnologue. Simons, Gary F. and Charles D. Fennig (eds.). 2018. Ethnologue: Languages of the World, 21st edition. Archived from the original on 5 January 2016. Retrieved 21 February 2018. ^ "Journal Officiel de la Republique du Senegal". Archived from the original on 18 May 2015. Retrieved 8 August 2018. ^ Hammarström, Harald; Forkel, Robert; Haspelmath, Martin, eds. (2017). "Arabic". Glottolog 3.0. Jena, Germany: Max Planck Institute for the Science of Human History. ^ "Al-Jallad. The earliest stages of Arabic and its linguistic classification (Routledge Handbook of Arabic Linguistics, forthcoming)". Archived from the original on 23 October 2017. Retrieved 27 October 2016. ^ a b "Documentation for ISO 639 identifier: ara". Archived from the original on 3 March 2016. Retrieved 20 March 2018. ^ "Christianity 2015: Religious Diversity and Personal Contact" (PDF). gordonconwell.edu. January 2015. Archived (PDF) from the original on 25 May 2017. Retrieved 29 May 2015. ^ "Executive Summary". Future of the Global Muslim Population. Pew Research Center. 27 January 2011. Archived from the original on 5 August 2013. Retrieved 22 December 2011. ^ "Table: Muslim Population by Country". Pew Research Center's Religion & Public Life Project. 27 January 2011. Archived from the original on 1 August 2013. Retrieved 18 May 2014. ^ "UN official languages". un.org. 18 November 2014. Archived from the original on 17 October 2015. Retrieved 18 October 2015. ^ "World Arabic Language Day". UNESCO. 18 December 2014. Archived from the original on 27 October 2017. Retrieved 12 February 2014. ^ Al-Jallad, Ahmad. "Al-Jallad. 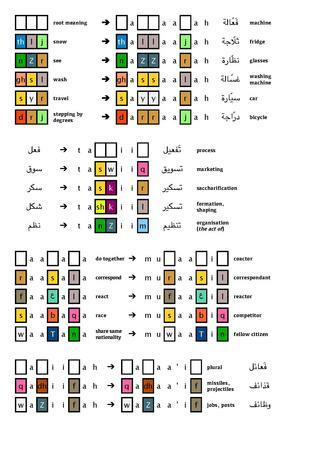 The earliest stages of Arabic and its linguistic classification (Routledge Handbook of Arabic Linguistics, forthcoming)". Archived from the original on 23 October 2017. Retrieved 15 July 2016. ^ Lentin, Jérôme (30 May 2011). "Middle Arabic". Encyclopedia of Arabic Language and Linguistics. Brill Reference. Archived from the original on 15 August 2016. Retrieved 17 July 2016. ^ a b Al-Jallad, Ahmad (30 May 2011). 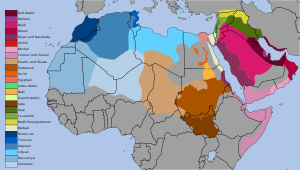 "Polygenesis in the Arabic Dialects". Encyclopedia of Arabic Language and Linguistics. Brill Reference. Archived from the original on 15 August 2016. Retrieved 17 July 2016. ^ "Arabic Language." Microsoft Encarta Online Encyclopedia 2009. ^ "Teaching Arabic in France". The Economist. Archived from the original on 25 September 2018. Retrieved 26 September 2018. ^ "Top 50 English Words – of Arabic Origin". blogs.transparent.com. Arabic Language Blog. Retrieved 14 December 2018. ^ EB staff. "Maltese language – Britannica Online Encyclopedia". Britannica.com. Archived from the original on 5 June 2008. Retrieved 4 May 2010. ^ See for instance Wilhelm Eilers, "Iranisches Lehngut im Arabischen", Actas IV. Congresso des Estudos Árabes et Islâmicos, Coimbra, Lisboa, Leiden 1971, with earlier references. ^ "Arabic – the mother of all languages – Al Islam Online". Alislam.org. Archived from the original on 30 April 2010. Retrieved 4 May 2010. ^ Coffman, James (December 1995). "Does the Arabic Language Encourage Radical Islam?". Middle East Quarterly. Archived from the original on 1 February 2009. Retrieved 5 December 2008. ^ "Mutual Intelligibility of Spoken Maltese, Libyan Arabic and Tunisian Arabic Functionally Tested: A Pilot Study". p. 1. Retrieved 23 September 2017. To summarise our findings, we might observe that when it comes to the most basic everyday language, as reflected in our data sets, speakers of Maltese are able to understand less than a third of what is being said to them in either Tunisian or Benghazi Libyan Arabic. ^ "Mutual Intelligibility of Spoken Maltese, Libyan Arabic and Tunisian Arabic Functionally Tested: A Pilot Study". p. 1. Retrieved 23 September 2017. Speakers of Tunisian and Libyan Arabic are able to understand about 40% of what is said to them in Maltese. ^ "Mutual Intelligibility of Spoken Maltese, Libyan Arabic and Tunisian Arabic Functionally Tested: A Pilot Study". p. 1. Retrieved 23 September 2017. In comparison, speakers of Libyan Arabic and speakers of Tunisian Arabic understand about two-thirds of what is being said to them. ^ Osborn, J.R. (2009). "Narratives of Arabic Script: Calligraphic Design and Modern Spaces". Design and Culture. 1 (3). ^ "Reviews of Language Courses". Lang1234. Retrieved 12 September 2012. Thelwall, Robin (2003). "Arabic". Handbook of the International Phonetic Association a guide to the use of the international phonetic alphabet. Cambridge: Cambridge University Press. ISBN 978-0-521-63751-0. For a list of words relating to Arabic, see the Arabic category of words in Wiktionary, the free dictionary. Wikimedia Commons has media related to Arabic language. Wikivoyage has a phrasebook for Arabic. Jastrow, Morris (1905). "Arabic Language and Literature" . New International Encyclopedia. This page was last edited on 23 April 2019, at 16:05 (UTC).